Well, it all comes down to this. 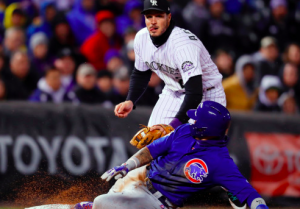 Both the Chicago Cubs and Colorado Rockies had a chance on Monday to claim a division title and a spot in the NLDS, but both fell a little short. Now, their season is on the line during Tuesday’s National League Wild Card Game. The winner will head to Milwaukee to partake in the NLDS against the Brewers. Meanwhile, the season is all over for the loser, putting immense pressure on both sides. The Cubs should have an instant advantage in this game by virtue of being able to stay home after Monday’s loss to the Brewers. In fact, the Cubs were home for the final week of the regular season, so they haven’t been forced to move in over a week. The Rockies, on the other hand, played at home on Sunday and then had to travel to Los Angeles on Monday. Following Monday’s loss to the Dodgers, they had to travel again, so they could be a little tired by the time they get to Chicago. In a win-or-go-home situation, the Cubs will send Jon Lester to the mound. Lester was their best starter during the regular season, going 18-6 with 3.32 ERA. He was also phenomenal down the stretch, going 4-1 with a 1.52 ERA in his five starts in September. Lester had struggled during the second half of the season prior to that, but he got his act together in September. He also brings with him a great postseason pedigree, as Lester owns a 2.55 ERA in 25 career playoff appearances. The Rockies will counter with a lefty of their own in Kyle Freeland. The 25-year old Freeland had a breakout season and was Colorado’s best pitcher this year, going 17-7 with a 2.85 ERA. Somehow, Freeland was better at Coors Field than he was on the road. However, he was still 7-5 with a 3.23 ERA away from home this year. The caveat is that Freeland will be pitching on three day’s rest, as the Rockies are taking a shot with their best pitcher, even if it means sending their young ace to the mound on short rest. The X-factor in this game could be veteran slugger Matt Holliday. The Rockies have a few hitters like Nolan Arenado and Charlie Blackmon who have had some success against Lester in their career, but none have the success that Holliday has experienced against the Cubs ace. Holliday is 7 for 15 in his career against Lester. Of course, he has just 13 starts signing rejoining the Rockies in late August. But he’s been productive late in the season, hitting .283 with an OPS of .849 in limited at-bats. Will Rockies manager Bud Black give Holliday a start given his history against Lester or will he save the veteran for one at-bat at a key moment in the game? Either way, Holliday could play an important part in this game. Both teams enter this game in a similar position, as each has to bounce back quickly after a disappointing loss on Monday and play a win-or-go-home game the very next day. While the Cubs didn’t finish the regular season playing as well as the Rockies, who won nine of 10 before Monday’s loss, Lester’s postseason experience could be the great equalizer. With the home crowd behind him, look for Lester to be at his best in front of the Wrigley faithful and carry the Cubs to the NLDS. Chicago wins 6-2.